Match #3: Pandemic Legion vs The Gorgon Empire. On the third weekend Pandemic Legion’s team expected a far more competitive and engaging set of matches than in previous weekends. Additionally, the live commentary from my CEO Elise Randolph would increase the pressure on us. While many viewers still considered PL to be weak so far, our opponents became increasingly stronger. The Gorgon Empire were no different, consisting mostly of former tournament team members from Darkside. They brought a high burst damage setup with one artillery fitted Sleipnir for links on the Saturday. During the week we had tested several different setups and our team captain Shamis Orsoz decided to bring something we had not fielded in ATXII so far: a tinker with only six ships. According to the statistics, a team bringing less people than allowed run a high risk of getting stomped very fast. With a natural high resist versus kinetic and thermal damage, the main problem for us was the high alpha of the Gorgon Empire team which could deliver a serious amount of damage within a short timeframe. (the match starts at 6:32:00 into the video) The Gorgon Empire went directly for the crucial fleet bonuses and primaried the most important links in this setup: me in the Eos. I was preheated as the timer started and they still were able to alpha me into half shields within five seconds. While Lucas Quaan put a few reps on me, Gorgon Empire switched to Manfred Sideous’s leadership alt in the other Eos. His Eos however only had a mix of additional links which were not tank related. Manny being primary for the next few minutes was a very good thing for us, as Gorgon were focused on him while we could decrease the incoming dps. One thing to remember is that alpha of the Sleipnir really put a lot of pressure on our logi fitted Tengu to keep the reps up. As we removed one Caracal from the arena our reps were finally able to tank the incoming DPS and we dropped into a comfort zone. Even with an eventual loss of Manny’s Eos we would have still been able to kill the remaining Gorgon Empire ships and bring the match home. Nevertheless, it was very important for us to keep him alive and there’s no doubt that the 16% structure remaining made my heart rush. 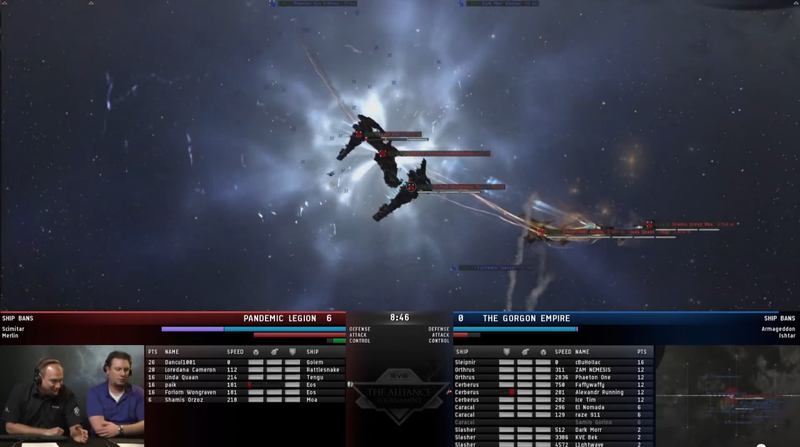 CCP Fozzie and Bachanallian missed an important piece of information in this match, although it was broadcast in local. Pandemic Legion fielded our flagship, piloted by former CSM Sala Cameron. While I can’t reveal its setup, it is very safe to say that viewers saw a very well fitted supercarrier in the shape of a Rattlesnake on the stream, especially with what effects purple mods have on several flights of drones. Two minutes into the match Gorgon tried to kill the Tengu but with the remaining DPS they were unable to contest our tinker again. Well fought! On the following Sunday we faced yet another excellent team: Rote Kapelle. In previous matches they were able to win without any issues, the stage was set for an interesting match no doubt. Hoping to bait Pandemic Legion into our previously fielded tinker, Rote Kapelle brought a neut heavy, drone damage based setup. Our team consisted of a new variation on the very successful ATXI sentry based cruiser setup, internally named “Goblins”. While it has links to improve survivability, there is no logi in this setup. One minute into the match Rote Kapelle has no chance to recover from these early losses. At this point we start to loot the field, especially the augmented drones deployed by Rote Kapelle. This match is the perfect example of the rock-paper-scissor meta in ATXII. Pretty much any other setup from Pandemic Legion would have had a really hard time fighting against Rote’s fleet. A slightly different approach by going for the Golem first could have ended with a better result for Rote Kapelle. Their lack of EWAR support would still have been a significant issue for them to turn the match in their favour however. With this match Pandemic Legion advanced to the final weekend. 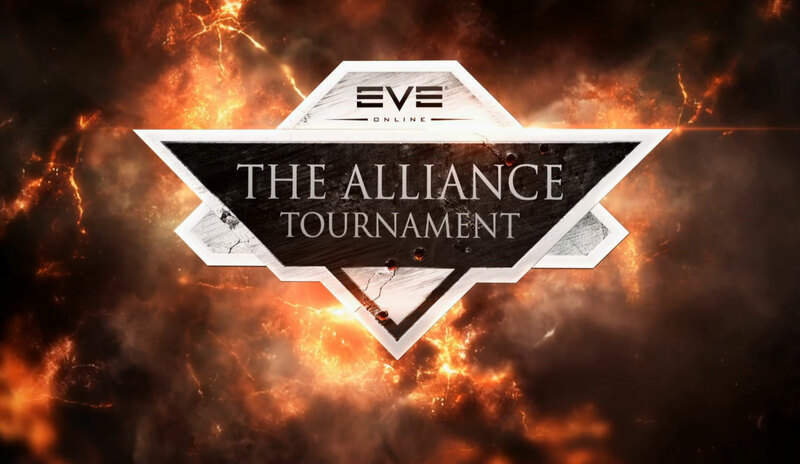 Although all our matches had strong opponents we were able to avoid the horror of the loser’s bracket while only revealing two of our own concepts. Additionally, we brought four completely different fleets which creates more issues for our future opponents as we have shown no preference for a specific meta. On top of that HUN Secunda were able to kick HYDRA into the loser’s bracket right after our successful run against Rote Kapelle. But more on that on the next Friday!